"A Novel Idea... Read Together"
Through “A Novel Idea… Read Together,” thousands of Deschutes County residents share the common bond of reading a selected book and participating in related cultural and literacy events each spring. This program is supported 100% by donations and grants. Deschutes Public Library proudly announces the 14th annual celebration of “A Novel Idea…Read Together,” the largest community read program in the state of Oregon. Each year “A Novel Idea” brings together thousands of Deschutes County residents to read, discuss and attend a variety of free cultural and author events at the Library’s six branches and at partnering businesses. 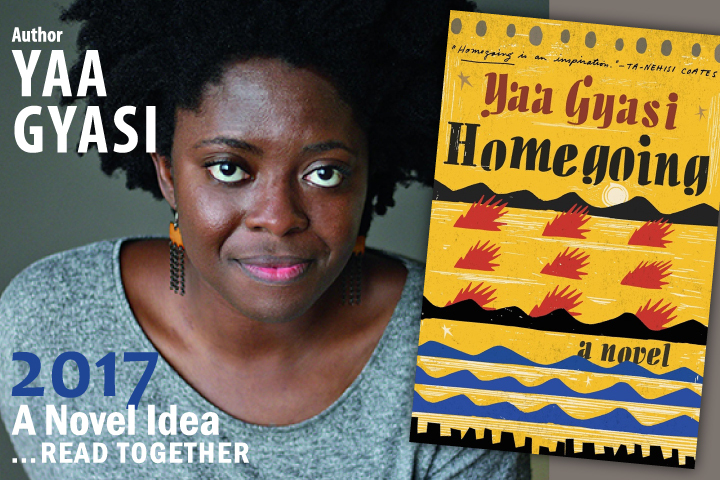 With this year’s selection of Homegoing by Yaa Gyasi , the Library anticipates the highly successful program’s continued growth. “Once again the ‘A Novel Idea’ selection will take us to new places and times,” says Community Relations Manager Chantal Strobel. “Books selected in the past have taken readers from Afghanistan to the Manhattan, and Papua New Guinea to Japan, as well as to time periods that span centuries. Homegoing promises to not only take readers to new places, but to bring new ideas and topics into the conversation,” she continued. “A Novel Idea” kicks off on Saturday, April 8, at 2:00 p.m. at the East Bend Library with a conversation exploring cultural appropriation, led by artist and speaker Jason Graham (aka, MOsley WOtta). What follows is four weeks of programs that explore and expound upon the themes and ideas found in Gyasi’s widely acclaimed novel. “The free programs are designed to enhance the readers’ experience by providing a common forum in which they can discuss ideas, discover culture, create art and explore similarities and differences in a safeand neutral environment,” says Liz Goodrich, lead project coordinator for “A Novel Idea.” “This year we’ve curated a range of historical and cultural programs that look at the role of storytelling in Ghanaian culture, the experiences of black pioneers in early Oregon, the transatlantic slave trade, African American literature, and so much more. We of course include book discussions and documentary film screenings, as well,” says Goodrich. The events culminate with a free presentation by author Yaa Gyasi Sunday, May 7, at 4:00 p.m. at the Bend High School Auditorium. A book signing follows Gyasi’s presentation. Tickets are required for the free event and become available on April 15 at www.dplfoundation.org or at any Deschutes Public Library. Reader’s guides will be available at each of the public libraries in Deschutes County beginning March 22. Free book club kits are available upon request—and while supplies last—by calling 541-312-1032. The New York Times bestselling novel Homegoing begins with the story of two half-sisters, separated by forces beyond their control: one sold into slavery, the other married to a British slaver. Homegoing traces the generations of family who follow, as their destinies lead them through two continents and three hundred years of history, each life indelibly drawn, as the legacy of slavery is fully revealed in light of the present day. Yaa Gyasi was born in Ghana and raised in Huntsville, Alabama. She holds a BA in English from Stanford University and an MFA from the Iowa Writers’ Workshop, where she held a Dean’s Graduate Research Fellowship. Her short stories have appeared in African American Review and Callaloo. Homegoing is her debut novel. “A Novel Idea” is made possible by generous donors: Oregon Cultural Trust, Capsugel, Oregon Arts Commission, The Bulletin Oregon Humanities, The Roundhouse Foundation, William Smith Properties, Pacific Power Foundation, the E.H. and M.E. Bowerman Advised Fund of the Oregon Community Foundation, and The Friends Organizations of the Deschutes Public Library. This program is supported by a grant from the Oregon Cultural Trust. Deschutes Public Library Foundation receives support from the Oregon Arts Commission, a state agency funded by the state of Oregon and the National Endowment for the Arts.